Marge Emch, the new owner of the Chateau LaCage Chambre d'Hote, has enjoyed miniatures for many years. Marge and her daughter, Kit Myers, have been collecting and decorating room boxes since they began the hobby together in 1980, when they took on the challenge of decorating two room boxes for a charity event. So began the enchanted adventure they share. While Marge lives in Wheeling, West Virginia, and Kit in a suburb of Cleveland, Ohio, they enjoy traveling to shows together. It was at the November 2000 Philadelphia Show that Marge was thrilled to first see the Chateau LaCage Chambre d'Hote. She feels honored to be it's new owner as it graces her home in Wheeling. Quite by chance, I came upon a large Victorian style birdcage in one of my favorite furniture and accessory stores. 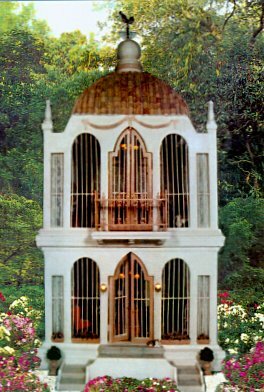 I saw the cage and thought, with its wonderfully proportioned doors and windows, it would make a unique setting for a miniature creation, so I purchased it. After studying the cage, I felt it suggested a rather exotic interior, and so LaCage d' I'IIe emerged. As it neared completion, I began to imagine who the people would be that would undertake such a project in real life. I imagined a young creative and talented couple who would enjoy a design challenge like this. Renee and Philippe appeared. Their friends and relatives play increasing roles as the story line develops, but Renee and Philippe have become the "Golden Couple" that has become the heart of each of the cage creations. After the completion of LaCage d' I'IIe, a second building was envisioned, similar to the first but to have a very different setting that would suggest a different treatment of the building and its furnishings. It became Chateau LaCage Chambre d'Hote. A proposed total of five cage designs, to be created, one per year, will complete the story. The story has become almost as much fun as the creation of these different structures. The current Cage III, which is Renee's new studio, is entitled La Cage Atelier. A young French couple, Renee a designer, and Philippe a writer, met while working in San Francisco, married and returned to Paris. While vacationing on a small privately owned island off the Southern Coast of France, they discovered an old abandoned structure that looked like an oversized bird cage. Intrigued by its possibilities as a dwelling, they purchased it from the cousin who owned the island, and transformed it into an exotic island hideaway. When Philippe's Aunt Sophie came to see the unusual hideaway, she found the two story, two room structure, enchanting. She engaged the young couple to design a similar structure to be built in the garden behind her centuries old Chateau, which she had recently renovated and opened as a Bed and Breakfast. She thought the addition of a small two room hideaway in the garden would make a wonderful "honeymoon cottage". It was to be carefully designed to mimic several of the architectural features of the Chateau itself, with a terra cotta tile roof, stuccoed limestone walls and a bedroom balcony. Renee and Philippe enjoyed working on this project so much that Renee decided to give up her position as a fabric designer with a firm in Rome open her own studio of design in Provence. Philippe happily agreed.